Effective project screening is essential to address and manage impacts on coastal and marine biodiversity at an early stage. The sooner the potential presence of important biodiversity values can be defined, the better the opportunity to identify and implement effective avoidance and other early mitigation steps. In many places there is a lack of information available for understanding coastal and marine biodiversity baseline to inform screening studies. Data gaps are widespread in many developing countries; and in areas where there is little information there is potential for features of high biodiversity value to be present. A lack of data may therefore mean that actions are taken for projects without fully knowing the potential hazards that projects may pose for coastal and marine biodiversity. Sometimes, when data do exist there can be improper bias about where development should occur due to misinterpretations that may arise when presence is assumed only for areas where data exist and incorrectly categorizing ‘no data’ areas as ‘low biodiversity value’ areas. This can often be associated with mapping approaches that tend to focus attention on where data exists rather than what may be present in the no data areas. In many instances, project decisions are postponed until robust levels of information are collected in line with a ‘certainty orientated approach’. This reduces the implementation and likely success of adopting early steps in the Mitigation Hierarchy, and can lead to a reliance on strategies to minimize and/or restore and/or offset development impacts, rather than avoid impacts. A constraint to improving baseline understanding is that collecting field data can be slow and require significant resources that may be lacking at early project planning stages. There may also be a lack of local capacity to conduct studies, and sometimes a robust understanding requires seasonal and multi-annual data collection that does not often align with developers’ timelines for undertaking such studies to support decision-making and permitting. The large extent of areas that need to be researched to fill data gaps means that data coverage is inherently limited. There can also be a focus of research in smaller localised areas of known value unless there are well funded coordinated approaches in operation that allow for wider survey effort. This focus may not necessarily be due to biodiversity value but may relate to historic identification of biodiversity hotpsots, where threats have been identified, proximity to researcher bases and easy accessibility to study areas. These aspects introduce potential bias and misunderstanding of the importance of coastal and marine biodiversity where gaps in information exist. Ineffective screening associated with data paucity, misinterpretation and a focus on developing certainty can hinder the implementation of the best approaches to protect coastal and marine biodiversity, and they also provide increased project risks during project execution (e.g. for permitting, funding, time and cost). The lack of effective screening means that the potential to avoid impacts on important habitats and species is reduced, which means there is greater reliance on later steps in the Mitigation Hierarchy, including restoration and offset. The delivery of like-for-like restoration offsetting is very challenging in the marine environment due to the lack of understanding of baseline conditions, including biophysical inter-connectedness, dynamic changes and the timeframes that determine presence, population structures etc. A lack of information also means offsets are often difficult to measure, and therefore, to accurately determine success. The adoption of early avoidance approaches for important features therefore often makes a great sense for biodiversity and business. This requires better early decision-making that takes account of risks so that priorities can be better considered and managed. It allows long term issues to be understood so that decisions are not focused on the short term project gains and immediate tasks. We understand what data is available externally and how to interpret it properly. We can provide access to resources held by our network of experts and give access to the data we hold. We also deliver pragmatic advice for commonly encountered issues building bridges with our data and knowledge. We also deliver baseline surveys to collect data for projects and also as part of the research we help to deliver using some of rapid assessment approaches. However, we understand that with these traditional approaches some gaps will remain and it is not always possible to collect comprehensive data at early project stages. In many instances, effective screening and implementation of early mitigation steps requires precautionary approaches to be taken forward. This is especially required to address a lack of data, but also to focus on addressing key priorities. To support such precautionary approaches, predictive tools may be used to inform site selection processes and early screening studies, which should include the understanding of potential critical habitat triggers. We have therefore developed tools and approaches that provide an indication of biodiversity value and allow rapid assessments to be made where information is currently lacking. In particular, we seek to develop approaches that provide a cascade of information that can be used for screening studies that focuses on potential value and provides low cost assessment opportunity. This is demonstrated in the schematic below and is discussed further under the discussion of respective tools below. Once issues have been raised at a screening stage it is should be possible to understand what measures should be adopted to address priorities. The understanding of these approaches sometimes requires project specific information, but often the way risks are managed can be quite similar. This is particularly easy to achieve for commonly encountered marine biodiversity issues where management advice that spans the Mitigation Hierarchy can be standardised and made accessible at an early project stage – See our approach to Common Guides. The delivery of standardised management advice is considered to present a subsequent step to the approaches shown in the above schematic to provide effective strategies to manage potential impacts on coastal and marine biodiversity features. These approaches promote the provision of pragmatic advice that help to avoid the risks that are associated with certainty based decision-making and data paucity. areas associated with key evolutionary processes. The first stages of this process are to understand the biodiversity features and values that may be influenced by a proposed development and also to define the spatial units for assessment, termed as “discrete management units” within GN6. This normally involves the collection of baseline information during the Project screening and execution process, whether that is achieved through the collation of existing literature, consultation and/or field survey. Once this information has been obtained GN6 provides a range of thresholds for gradients of critical habitat. Often, detailed critical habitat assessment is undertaken as part of the impact assessment process once a Project is defined and some baseline studies have been undertaken, especially to ensure that measurement against critical thresholds can be made. However, good practice requires the screening of critical habitats at an early project stage. As discussed above, a limitation to effective screening of critical habitats may be related to data paucity and there may also be a delay in making decisions whilst data is being collected. Also misinterpretation of data gaps may mean that critical habitat triggers may not be identified at an early stage. Raising a flag for a critical habitat trigger at a country level: Identifying potentially qualifying sea turtle and marine mammal species in a country of interest. Clearly there is a great variation of the absence/presence of high biodiversity values and features at a country scale and therefore the output of the screening tool only aims to be very broadly indicative of potential presence. The tool provides a precautionary note on the potential presence of triggering species in a country where a project is being considered. A high level assessment for transient species where there are large data gaps also potentially avoids misinterpretation associated with mapped data. Once a trigger is flagged, this can then be followed by more detailed consideration of risks and followed up by local project site assessments – using rapid assessment approaches as a starting point, including our tools (see below). Providing a species summary as to why it is a trigger for critical habitat: The tool shows the reasons why a sea turtle or marine mammal species that may be present in the area where a Project is considered to be a potential trigger for critical habitat based on GN6 criteria. This requires a limited understanding of species presence/absence in the area where a project may be developed in order to select the species in the tool. Only species that may act as a critical habitat assessment trigger are presented. Therefore if a species is not listed it may not be a specific trigger, unless it forms a key feature of a designated important habitat area etc (see GN56 and GN57). If the tool identifies the potential presence of a critical habitat trigger then this can be used to help select where a development is proposed and/or also set out the starting requirement for undertaking further screening and/or more detailed assessment. The tool therefore only aims at only broadly indicative to highlight potential issues of high biodiversity concern for a Project. It may, however, provide sufficient information to commence the adoption of biodiversity action planning at the outset with the intention of implementing measures across the Mitigation Hierarchy as early as possible. Sea turtle nesting grounds are under considerable threat from development. Often there are little or no data available from sea turtle monitoring to help inform development decisions. To address this issue, we have partnered with the Centre for Ecology & Conservation at the University of Exeter to draw upon best available current knowledge of sea turtles worldwide to develop a Sea Turtle Nesting Beach Indicator Tool that can rapidly assess and rank the value of beaches for their potential sea turtle nesting importance in areas where there is an absence of biological data. The tool is designed for use by developers, consultants and researchers to quickly determine the spatial extent of sea turtle nesting and the relative habitat value of different beaches where nesting is possible, but poorly understood. 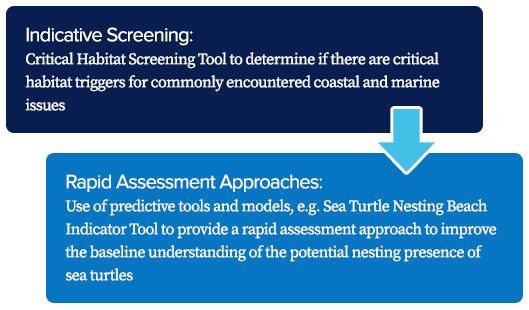 The simplicity of the tool was considered a core aim rather than a weakness, and we hope that this easy-to-use tool that has relatively low cost to utilise in the field will promote better early stage decision-making by developers whose projects may impact sea turtle nesting areas. The tool is built around an Excel spreadsheet supported by an explanatory document in pdf form, and is therefore easily shared and disseminated by email. It employs a scoring and rating system to assess Beach Suitability, which is the potential for supporting a viable nesting population based on habitat features; and Human Impacts and how these are affecting nesting beaches. The tool provides indicative rather than conclusive results on nesting potential, i.e. indications of poor suitability for certain beaches should not be used as evidence there is no nesting. As such, the tool is useful in lieu of, and supplementary to, seasonal surveys that record the signs of nesting activity. In most cases the indications generated by the tool should be followed-up by more rigorous surveys performed by specialists, since the tool does not collect biological or seasonal information, nor does it rely on long term data sets. The tool has been announced in the Marine Turtle Newsletter (#153, 2017) http://www.seaturtle.org/mtn/PDF/MTN153.pdf and articles published in the Africa Sea Turtle Newsletter (#8, 2017) http://oceanecology.org/african-sea-turtle-newsletter/ and State of the Worlds Turtles (SWOT) Report, Vol. XIII http://www.seaturtlestatus.org/. An additional article on the tool is also pending for publication in the next edition of the Indian Ocean Turtle Newsletter https://www.iotn.org/. Please complete the form to download the Sea Turtle Nesting Beach Indicator Tool. After completing the form the download should start automatically.